Frank Tooley, who does odd jobs at New Beginnings Church, stands in the church lobby just after a poll closed in the lobby Tuesday. Behind him are canned goods the church is collecting for a Thanksgiving food drive, and a motorcycle it will auction off to raise money for a community center across the street. Chicago stuck to its faith in the governor's election Tuesday, overwhelmingly blessing the Democrat, Pat Quinn, citywide—but the Magnificent Mile opted for a higher power. In the gallery of the stately, 100-year-old Fourth Presbyterian Church, at Michigan and Chestnut, Mag Milers anointed Republican Bruce Rauner, 285-153. Rauner's 65 percent here, in the 34th precinct of the 42nd Ward, was his best showing in the city's 2,069 precincts. And it helped Rauner win the 42nd Ward, 50 percent to 48 percent. Winning a ward in Chicago is a rarity for a Republican candidate for governor. Quinn won the other 49 this year, and all 50 in 2010. Rod Blagojevich likewise swept 50 in 2006. Quinn almost lost the 43rd Ward (Lincoln Park) as well Tuesday. 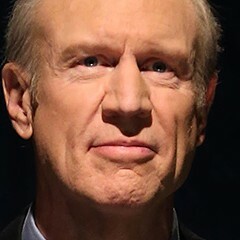 He slipped by Rauner there, 7,655 to 7,565 (49.67 percent to 49.09 percent). The 41st Ward, on the far northwest side, was the only other close one, with Quinn prevailing, 50 percent to 47 percent. Rauner's next-best ward was the 2nd, on the near west side, where he got 44 percent. The 42nd Ward, which includes the North Loop, River North, the Fulton River District, Streeterville, and the Gold Coast, is Chicago's richest. All four of the wards in which the Winnetka Republican did well are predominantly white and include the city's most affluent areas. Quinn got 77 percent of the citywide vote this year, up slightly from 75 percent when he beat Bill Brady in 2010. But Chicago helped him out less this year than four years ago. Though the number of registered voters here was up slightly—from 1,334,807 in 2010 to 1,368,708 now—turnout was down: 53 percent of those registered in Chicago voted in 2010, but only 47 percent voted this time. So 65,754 fewer votes were cast in Chicago this year than four years ago. All told, Quinn's margin in Chicago this year was down 45,000 from 2010. That's significant, but it wasn't decisive—Rauner's statewide margin with just about all the votes counted is 172,000. The 35th precinct of the 20th Ward voted in Reverend Brooks's church Tuesday. I talked with 62-year-old Frank Tooley, a self-employed home remodeler, in the church's long lobby as the poll closed. 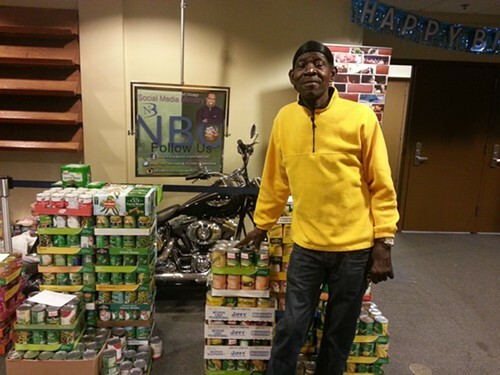 Tooley is a member of New Beginnings and also does odd jobs for the church for pay. 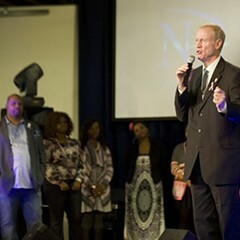 He said that while Brooks made it clear he backed Rauner, he didn't pressure members of New Beginnings to do likewise. Tooley had voted earlier in the day on the west side, where he lives. He declined to say if he went for Quinn or Rauner. He said he had mixed feelings about the candidates. He thought the Democrats made a reasonable argument that Rauner cared only about the rich. On the other hand, he said, "If you're a billionaire and you have a good heart, you're gonna help people who are less fortunate." Tooley was most concerned about the lack of jobs on the south and west sides. "All these shootings and killings—a lot of that wouldn't be happening if there were jobs," he told me. "When you don't have a job, all you do is hang out, and of course you're going to run into problems." I asked him who he thought was more likely to improve the employment picture, Quinn or Rauner. He said he didn't have much faith in either candidate "doing what's necessary to make that happen. It's something you just hope and pray for." The vote result in the lobby of New Beginnings was the same old: the precinct went for Quinn, 275 to 11. 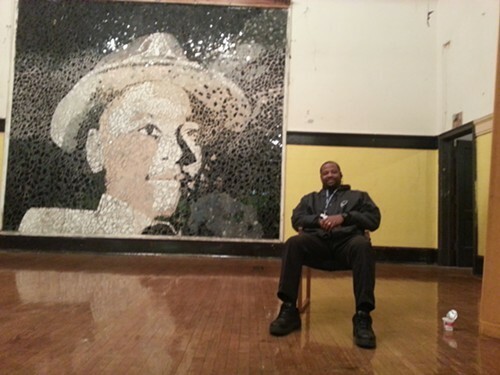 Timothy Powell Sr., a security guard at Emmett Till elementary, sits on the stage in the school auditorium Tuesday evening while Woodlawn residents vote in the back of the room. An hour before I talked with Tooley, I was a few blocks east, at Emmett Till elementary, where the 18th precinct of the 20th Ward was voting in the back of the school auditorium. Timothy Powell Sr., 44, Till's security guard, was sitting on the stage. He lives in Englewood, and had voted earlier for Quinn, who he believed was more likely to raise the minimum wage. Powell works a second security job for a warehouse at night, for which he gets the minimum. "People are working hard jobs, and their check is worth nothing," he said. "So they quit and start doing things they shouldn't, to make easier and faster money." Like selling drugs, he said. If the minimum wage was raised, "they would keep the job and they wouldn't have time to be on the streets." I asked Powell what he thought of Reverend Brooks's endorsement of Rauner. Powell pursed his lips and took a moment to respond. "He might be right. A lot of the Republicans are really rich. They might be for the rich, but they also have the money to help us, maybe more than the Democrats will." Those voting at Emmett Till went for Quinn, 256 to 5. The 20th Ward voted 95 percent for Quinn. The city's Hispanic vote isn't as easy to gauge, since Hispanics aren't concentrated in wards as much as African-Americans are. The predominantly Hispanic wards on the southwest side were a breeze for Quinn, but not the gale he got in the black wards. Quinn won 84 percent in the 22nd Ward (South Lawndale), which is 87 percent Hispanic and 8 percent African-American. In Alderman Ed Burke's 14th Ward (Archer Heights, West Elsdon, Brighton Park, Gage Park), which is 80 percent Hispanic and 17 percent white, Quinn got 74 percent. In the 12th Ward (McKinley Park), which is 82 percent Hispanic, 9 percent white, and 7 percent Asian, he got 78 percent. The gap in quality of life between Chicago's wealthy white wards, where significant numbers went for Rauner, and the city's poor black and black-and-Hispanic wards, is enormous. That gap will be a key issue in the upcoming race for mayor, just as it's an important factor in how the city is governed. The divide is a result of the city's astounding racial segregation, which has concentrated poverty for generations. It's a problem so deeply embedded that it would be monumentally difficult to remedy even if elected officials were trying explicitly to do so, which they aren't. The gap between Illinois' major metro area and the rest of the state is also striking, though also not new. The close statewide result, 51 percent to 46 percent, at first blush hides this chasm. Quinn took Cook County by 390,000 votes (thanks mainly to his 356,000 vote advantage in Chicago); Rauner took the state's other 101 counties. While Quinn trounced Rauner in Chicago, 77 percent to 21 percent, Rauner cruised outside of Chicago, 59 percent to 40 percent. That age-old split, between Chicago and Illinois outside of Chicago, has long been central to decisions made in Springfield. 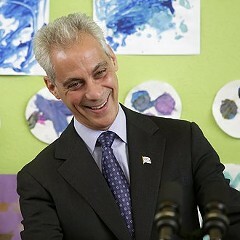 It hasn't hurt the city in recent years to have the governor and the leaders of both houses. 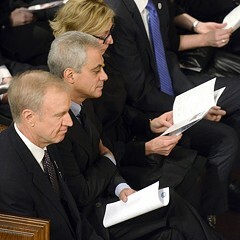 All three are still Cook County residents, but now one is from a wealthy suburb and a different party. Taxes, weed, Madigan—what will governor-elect Bruce Rauner do?